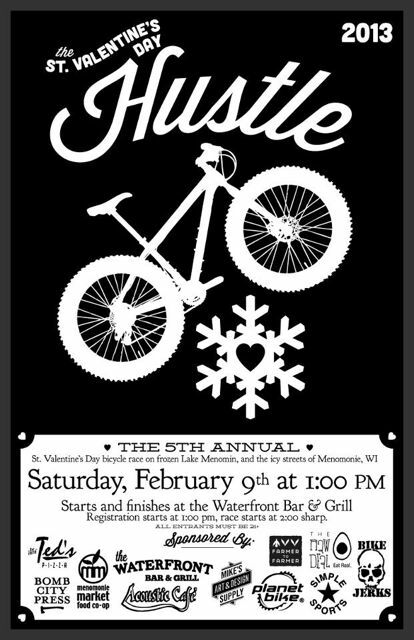 For several years now, my friends have organized a bike race, The Saint Valentine’s Day Hustle, on the lake that forms the center of our town. Though I don’t race myself, over time I have learned that the Hustle is an icy, gorgeous romp. Riders negotiate a series of cycling challenges in order to get their cards stamped. From one year to the next, riders don’t know if they’re going to get wieners thrown at them or have to tie a maraschino cherry stem with their tongues. At race’s end, they leave the lake with frozen sweat clinging to their eyelashes. That evening, the race organizers light a bonfire — with flaming arrows, no less — and roast a deer heart, which any brave soul can nibble if he or she dares. Not everybody’s cup of tea, I know. But I really like it. This year at the bonfire, I marveled once again at the just-rightness of the race. 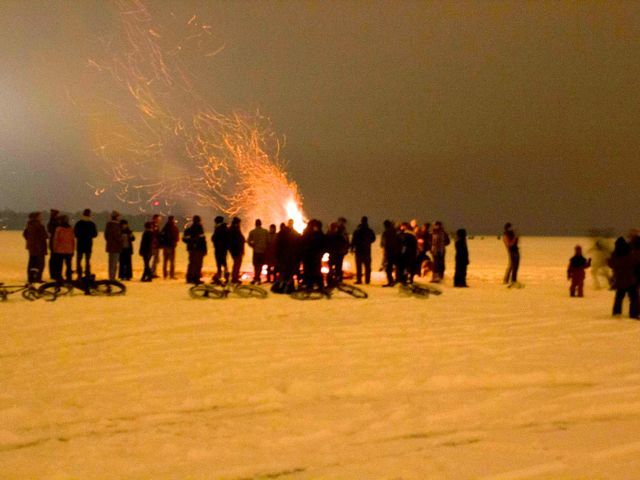 It works because the organizers and riders are committed and creative and also because a race on a frozen lake is scary enough to get people’s blood flowing. Finally, there’s the fact that a frozen lake is simply magical. Those are the elements, then: camaraderie, risk, and magic. Inspired by the Hustle, I brainstormed a list of low-tech, high-energy events to bring people together around food. None of these events ends with the roasting of a deer heart, but all of them are open to customization and local flavors. Years ago, I attended a clothing swap party. A dozen people gathered with wine and cheese and circled “cake-walk” style around a pile of clothing everyone had brought. Each guest got to pull one item from the pile, thus allowing all of us to yield an unused clothing item in exchange for one we felt more likely to wear. A similar format could work for pantry clearing. Guests bring items they have no plans to eat and exchange them for items that pique their curiosity. In order to create community art exhibitions that people want to see, gardeners could be encouraged to upload photographs of their harvest, perhaps even their giveaway items. When these green-thumbed gardeners give their items away, the lucky recipients could be asked to document (photographs or drawings or macaroni collages) what they made with their goodies, developing a kind of “before-and-after” food photograph collection. A local coffee shop or gallery could then display these large-format photographs, hosting a local-focus reception to allow these community artists to mingle. To get children involved in the public-arts circus, a parents’ group could purchase paper and art tools for local restaurants, perhaps during a slow season in summer or in conjunction with a fund-raising campaign. Give the kids a theme or let them draw whatever they like. A more ambitious program might provide a model in the restaurant space, creating a more unified display. Community cookouts and block parties are popular activities in late summer and early fall that do a good job of bringing people together with food, games, and music. This makes a community cookout an excellent place for a share space — a place to solicit and organize community opinions about questions that leaders are wrestling with. Something as simple as sidewalk chalk and a question written in 10-inch letters could elicit a community-wide discussion of public garden space or the best ways to clean up downtown sidewalks. Simpler, entry-level questions like "What’s your favorite local food?" could spark questions about why local food matters. These responses could be photographed and collated, offered to city councils or other civic groups. An Internet trend I have enjoyed is the re-imagining of the '"For with the detachable tabs (that originally contained only phone numbers). The main sheet could contain a simple idea about food. The perforated tabs at the bottom could feature a food-purchase habit-change the reader could adopt as a short-term goal. Like the Hustle, these projects can grow and change as community needs change and as organizers’ interests evolve. Now, tell me your ideas.